Red Palm oil is derived from the fruit of the palm tree (Elaeis guineensis) and is so named because of its characteristic dark red colour. It gets its colour from carotenes, such as alpha-carotene, beta-carotene and lycopene, the same nutrients that give vegetables like tomatoes and carrots their colouring. Red Palm Oil also contains tocopherols and tocotrienols (members of the vitamin E family), Co-enzyme Q10, phytosterols and glycolipids. 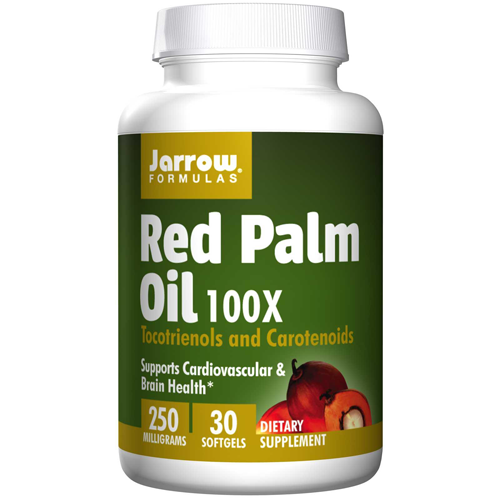 The Spectra Red Palm Oil found in Jarrow Formulas Red Palm Oil Softgels is concentrated 100X to contain the phytonutrients found in two tablespoons of red palm oil. Take 1 softgel per day, preferably with meals or as directed by your qualified healthcare professional. 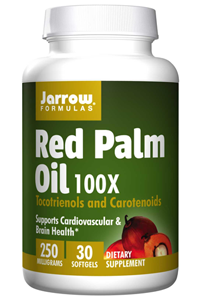 Jarrow Formulas Red Palm Oil is non-GMO, not hydrogenated and does not contain any trans-fatty acids.